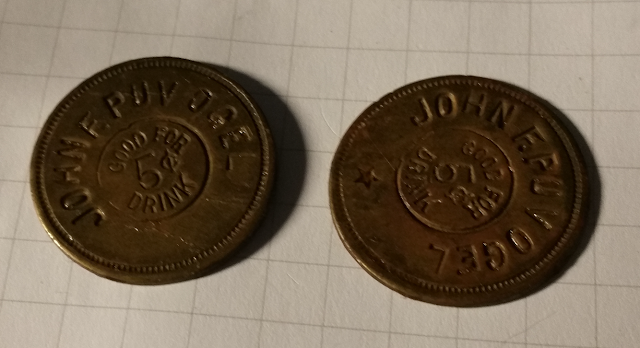 Tavern tokens. That should be a thing. I like it! And that reminds me, are you still sending out Tavern membership cards? Gah! I forgot all about those. I hope he is -- or else someone yoinked mine en route! still have a stack - i got derailed last year. This reminds me of the ivory chips needed to enter the Golden Camel in Eskadia, coincidentally on sale for $10 at Troll Lord Games. My two players, both thieves, had a hard time acquiring one. I came up with another way to get one (as their standout & planned ambush of a client did it pan out). It was a lot of fun. Kudos to Casey Christofferson for writing an intriguing city in his Haunted Highlands setting. If a token is worth one ale and the price of ale fluctuates in a location, the discovery of a horde of these tokens could have some strong effects on the local economy. Maybe even the regional economy.